The What Everyone Needs to Know (WENTK) series offers a balanced and authoritative primer on complex current event issues and countries. Written by leading authorities in their given fields, in a concise question-and-answer format, the books provide inquiring minds with the essential knowledge needed to engage with the issues that matter today. Catch up with the authors of the What Everyone Needs to Know series on the OUPblog every other week. As we celebrate the lives and accomplishments of women around the world as part of Women’s History Month, we offer a brief look at changing gender roles in different periods of China’s past, and at a group of contemporary activists pushing for greater equality between men and women in the current era. In two excerpts on women from their forthcoming book, China in the 21 Century: What Everyone Needs to Know, Maura Elizabeth Cunningham and Jeffrey N. Wasserstrom place events that have taken place since Xi Jinping took power into a long-term historical perspective. Was the status of women the same under all dynasties? Shifts in the status of women—or the lack thereof—offer evidence for the need to think about variations as well as continuities across dynasties. Modern observers, both within China and outside the country, criticize Confucianism for creating a patriarchy that oppressed women in imperial China. Yet women had very different experiences depending on the time, place, ethnic group, and social class in which they were born. It is therefore impossible to generalize about the status of women in traditional China—although the historical records that have survived mostly tell us about the lives of women who belonged to the upper classes. During the Tang Dynasty (618–907 c.e. ), for example, elite women participated in society and enjoyed a higher degree of autonomy compared to women in the Song Dynasty that followed. The Song, a time of Confucian revival, saw the spread of foot-binding and the confinement of women to the home. Yet although they were physically more restricted, elite Song women were generally literate, possessed greater property rights than women who came before or after them, and also took an active role in arranging the marriages of their children. Upper-class women who lived during the Ming and Qing dynasties cultivated their skills in writing, needlework, poetry, and music, many of them becoming highly accomplished in these arts of the domestic sphere. Very few women questioned the social structures that kept them tied to the home while men controlled China’s political, legal, educational, and economic institutions. (Although the idea that women remained at home while men went out into the world divides things too neatly; plenty of elite women traveled.) In their own ways, elite Ming and Qing women carved out spaces for themselves, creating vibrant intellectual, cultural, and social networks. As noted, the examples above all focus on the experiences of upper-class women; servants, courtesans, widows, and impoverished women lived within many more social and economic constraints. This is also not to overstate the agency of women in imperial China, but to point out that the common narrative about women’s victimization under Confucianism needs more nuance. The status of women varied considerably with time and place, and seemingly rigid Confucian ideology often proved more fluid in practice as both men and women adapted to political, economic, and social changes. Who are the Feminist Five? One case that symbolizes the increased repression of civil society in the era of Xi Jinping is that of the Feminist Five, a group of activists arrested in 2015. The members of the group, who were based in several different Chinese cities, planned to hold a protest that year on 8 March (International Women’s Day) that involved handing out stickers and leaflets decrying the prevalence of sexual harassment on public transit. Before the protest could take place, though, public security authorities moved in and arrested at least nine of the women organizing the action, accusing them of “picking quarrels and provoking trouble.” While some were quickly released, five remained in custody and soon became known as the Feminist Five. The Feminist Five case outraged onlookers, both within China and around the world. US politicians and diplomats issued calls for their release. Although not all Chinese supported the women’s causes or their tactics (in a previous protest against domestic violence they had worn wedding dresses smeared with blood), many ordinary people also urged the government to release the Feminist Five. After five weeks of detention, authorities freed the women—although they remain under government surveillance and risk re-arrest if they push the boundaries too far. The Feminist Five case is an example of how the space for protest has shrunk since Xi came to power. Gender equality and feminist causes are, at least officially, endorsed by the Chinese Communist Party, and in the past they have fallen into the safe zone of issues that could be publicly discussed. But the arrest of the Feminist Five signaled that the safe zone had disappeared. Featured image credit: “Activism, Feminism” by Joody Runtgon. CC0 Public Domain via Pexels. Jeffrey N. Wasserstrom is a Professor of History at the University of California, Irvine. His previous books include Global Shanghai, China's Brave New World, and Twentieth-Century China. 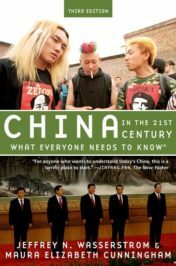 Wasserstrom is the co-author of China in the 21st Century: What Everyone Needs to Know. Maura Elizabeth Cunningham is an Associate at the University of Michigan's Lieberthal-Rogel Center for Chinese Studies. She has written on modern Chinese history for the Wall Street Journal and the LA Review of Books. Cunningham is the co-author of China in the 21st Century: What Everyone Needs to Know.